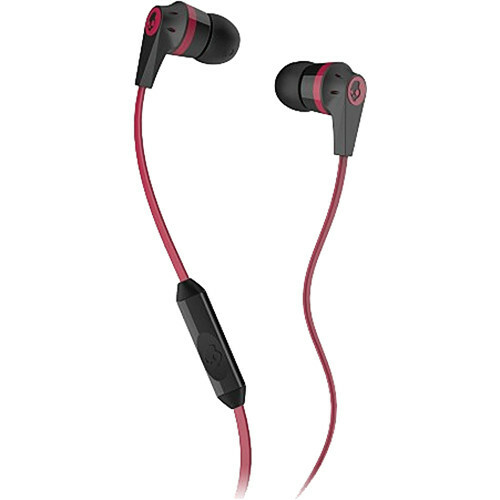 The black and red Skullcandy INK'D 2 Earbud Headphones feature a stylish profile and equally matching sound quality. The lightweight design makes them ideal for life on-the-go and the 11mm drivers deliver solid bass and detailed high-end response. The cable features a 3.5mm gold-plated mini connection and in-line microphone with remote control for taking calls and playing music. Box Dimensions (LxWxH) 5.1 x 2.2 x 0.6"
INK'D 2 Earbud Headphones (Black and Red) is rated 4.1 out of 5 by 40. Rated 5 out of 5 by Eduardo C. from Extremely Durable Picked these headphones up from B&H, minus the mic. I initially thought they were pretty good, not too amazing. The sound was in line with the price range, and the cord was better than average. Then they accidently went through the washer and dryer, and I was certain they were dead. Amazingly, they functioned perfectly, as well as they did straight out the box! I am pretty sure it cut the earbuds life span in half, but it is very impressive they survived being doused and water then dried in over 100 degrees. Would buy again. Rated 4 out of 5 by wkm001 from Very Good These headphones come with two pair of silicone ear inserts. For me they seem like small and medium. I could really use a large to make them fit more snug. Although I can go jog without them falling out.The mic works very well, maybe even better than the built in mic on my Galaxy S3.A single quick press of the button beside the mic operates the play/pause feature for every app I have used so far. Pandora, Pocket Casts, Google Music... A long press of the button brings up the digital assistant. On my Galaxy S3 this is a little funky. If the screen is off it brings up S Voice. If the screen is on it brings up the Google assistant.Overall the sound quality is good, they need to be broken in a little longer though. For a 11mm driver the bass seems a little weak. Rated 3 out of 5 by MintM from Mixed feelings I do like the fact that the earbuds block a lot of sound, almost like earplugs. The sound quality is actually really nice. No complaints there. My only issue is the earbuds falling out (although the soft rubber makes them better than some) and also one glitch; the microphone on the cord is so easy to press, that if you attach it to your iPhone, it constantly (and accidentally) turns iTunes on. Then the phone battery runs down. That is driving me a bit nuts. Rated 5 out of 5 by A Ronald G. from Bought by mistake, but like them. I intended to buy earbuds without a mic to use with my iPad mini for movies, iTunes, etc. at times when I didn't want to bother others but made a mistake in ordering. They are cheap enough that when they arrived I figured I'd just try them and discard them if I didn't like them. Pleasant surprise: They do a great job of controlling iTunes and worked well with Skype. My iPad is now a credible smart phone. Rated 2 out of 5 by Bill M. from Flat sound The sound is overall flat - poor treble and poor bass. Midtones are flat. I was expecting a lot more from these. Spoke to some friends (after the purchase and sound experience) who universally said the brand has this typical sound output. Not trying to bash anybody/brand, but don't want to see others experience same disappointment. I would return these but you basically have to destroy the box to get them out - so I've put them with the other cheap earbuds. I am very pleased with my JVC and Sony earbuds (about the same price range). Rated 3 out of 5 by Gil from Good Value work well If you're not too much of a stickler about sound quality these are good. They are cheap and so you don't have to worry about breaking them or loosing them. Its not audiophile quality sound, but you should know that when buying them. They sound pretty good, enough for listening to music on a train or subway, and doing phone calls, Skype etc. No, these earphones only have a microphone and a play/pause button. There are no volume controls. Do these work on a PC?